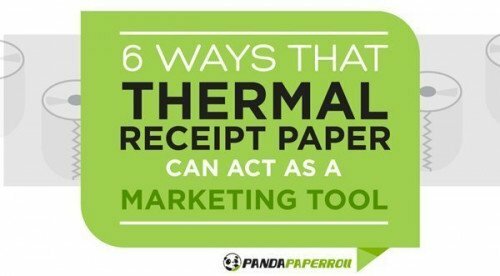 What many don’t understand these days is that even though so many aspects of the retail industry have gone digital, printed receipt paper is alive and very well and it is a new marketing trend. Receipt paper shouldn’t be looked at simply just as paper but it needs to be seen for it’s excellent capabilities in advertising. There is no other type of advertising that can do what it does and this article will discuss those reasons why it is still relative and an effective form of great marketing. Printed receipt paper targets those individuals who make the household decisions and by the receipt entering their hands every time they go shopping, you can’t beat that type of advertising. These people are customers and they can also attract new customers as well. The local business has these shoppers living within a short radius of their establishment and by letting them know that, there is more business to be had. One of these keys to getting business is capturing the attention of customers through the merits of image. Receipt paper always utilizes full-color printed ads which are magazine quality that never smudge or smear in the grocery bag when it comes into contact with moist ice cream containers or milk gallons. It will always keep from fading and remain attractive and sharp for a long time. It is a fact that the average person will go shopping up to 2-4 times out of the week. If you do the math, this would mean that the typical household will receive printed receipt paper every 8-16 times a month. Many other forms of advertising that locally target only get their ads across once a month. It seems like a no brainer that when you target an audience with that much reoccurrence, you have a way better chance to hit the target. You can see that you have so much capability in targeting such a wide audience with receipt paper, you have image, attractive presentation and it is recurrent. Then on top of that, you will have an ad that is hopefully something that is just hard to resist for a consumer. When that irresistible offer lands into the hands of the local consumer who hits the grocery store up to 18 times a month, you’re sitting pretty. You might be wondering how much can something this good cost? The reality is, that is the most interesting aspect of it because printed receipt paper has the lowest investment rate out of virtually all forms of print advertising. Print advertising can only cost a business $6-$17 a day with advertising that rolls around the clock. That is essentially $175-$500 a month, which all simply depends on the amount of traffic that a business pulls in. As you can clearly see, if you ever thought that paper is dead, far from it. Countless retail outlets all across the world will tell you the very same thing, printed receipt paper is here to stay.